I have submitted this drawing to James Wagner for his online gallery of hand-drawn images of PS1's "Greater New York 2005." He initiated the gallery after finding out that the oh-so public-minded PS1 has a photo ban on all artworks. The image above is a detail of Gedi Sibony's Disguised as Material Properties. The materials are a cardboard box, twigs (held together with wood putty), plastic sheeting, and a wood panel with circular holes cut in it. 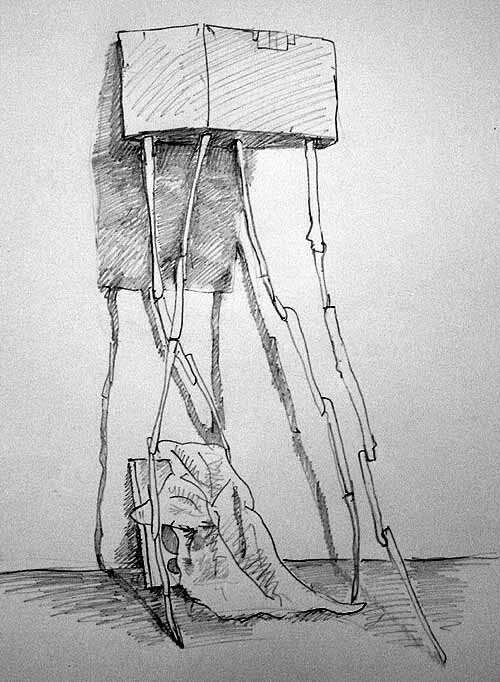 The box is affixed to the wall and the "legs" appear to be half-supporting it, half dangling from it. Very crude, but nice. After War of the Worlds came out, it's hard not to think of a DIY version of the Cruise-menacing alien "tripods." As for the show as a whole, one can see why it inspired a critical yawn. An awful lot of student-level painting: if this is what the Bush millionaires are clawing each others' eyes out over, we can only snicker at them. And we could all use a hit of whatever the curators were smoking ("Looked at a certain way, this is kind of good--pass me that pipe again.") Exceptions are Anna Conway's Magrittean painting of figures lying with their heads in tree-reflecting pools, next to another one of huge clown faces in storm-tossed seas, which are well-rendered and genuinely odd images. Dana Schutz is a good neo-neo-Expressionist, but her giant, multi-character Emil-Nolde-by-way-of-the-Dutch-Masters "anatomy lesson" canvas strains to be over the top. As usual for this media-babysat generation, the videos fared better than the objects. Thumbs up for: Sue de Beer's new nonviolent work, which is becoming quite sumptuous in its use of colored gel lighting and classical photo-composition, albeit deliberately problematized by the splitscreen and without stinting on the essential agony of the pimply teen years; Meredith Danluck's slightly ghoulishly bleached out boy in tuxedo tails tapdancing to a trancy electro score; and Mika Rottenberg's sweat-wiping truckdriver with bicycle-driven conveyor belt feeding her new! more absorbent! tissues (also genuinely odd).